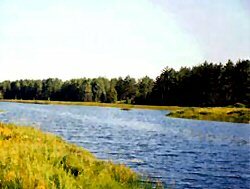 The Fox River system is located in Alger, Schoolcraft and Luce counties in the eastern half of Michigan's Upper Peninsula. The mainstream of the Fox flows south from northeastern Alger County through flat sand plains and lowland hardwoods to its confluence with the Lake Branch of the Manistique River, which continues on the Lake Michigan. The Fox’s East Branch, West Branch and Little Fox are its main tributaries. The East Branch joins the Fox River Mainstream about a mile above the Manistique River and is nearly equal to the Mainstream in length and discharge. The basin is approximately 26 miles long and 10 miles wide.